How Philip Hyde won the wilderness West: PHILIP HYDE SHORT VIDEO. JOIN THE BLOG to receive each blog post article in your inbox <Landscape Photography Blogger>. Be sure to visit current "Museum & Gallery Exhibitions" under PRESS/ EVENTS tab. "Philip Hyde has the outstanding ability to interpret through a lens the qualities in native landscapes. 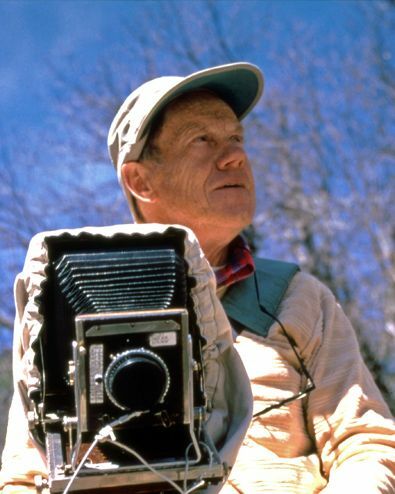 His photography is most effective in molding public opinion supporting the preservation of wilderness integrity against the march of utility." Photograph on the left: "Philip Hyde With 4X5 Baby Deardorff at Home" by Steve Dunsky who visited to make a motion picture interview the same day circa 1986.